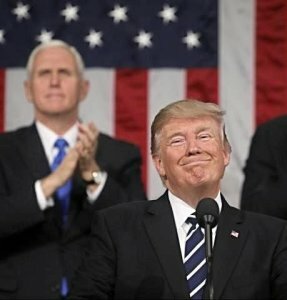 President Trump will deliver his second State of the Union (SOTU) address next Tuesday night, traditionally an occasion for outlining issues facing the nation, an administration's accomplishments and agenda for the future. The State of the Union address, as mandated by Article II, Section 3 of the US Constitution, is an annual report from the President of the United States to a Joint Session of the US Congress, the Justices of the Supreme Court, the Joint Chiefs of Staff and the Cabinet. The House Speaker and the Vice President (also the President of the Senate) sit behind the President. Since the Cold War, one member of the Cabinet does not attend so, in the event of a disaster, there is a "Designated Survivor." In addition, following the September 11, 2001 terrorist attacks, congressional leadership began designating two members from each house of Congress, representing both parties, to remain absent from the Capitol during the President's speech. The heads of 15 executive departments will be among the attendees, as well as representatives of the Executive Office of the President, which includes the White House Chief of Staff, Administrator of the Environmental Protection Agency, Director of the Office of Management and Budget, and the US Trade Representative. Reclusive First Lady Melania Trump will take her place in the gallery, along with special citizen guests invited by the President. The tradition of honoring everyday Americans at the State of the Union dates back to Ronald Reagan's 1982 recognition of Lenny Skutnik for heroism following the Air Florida Flight 90 crash. The 10-15 guests normally are individuals who have performed an act of heroism or achieved an impressive milestone that illustrates an important theme in the President's speech. Trump's January 30, 2018 SOTU was billed in advance by the White House as a unifying and bipartisan address. Instead, the one hour, 20 minute scripted speech did little to disguise what the Los Angeles Times called Trump's "familiar appeal to fear and resentment, particularly toward noncitizens and foreign adversaries." The speech came on the heels of what was already considered one of the most controversial and divisive years in presidential history. 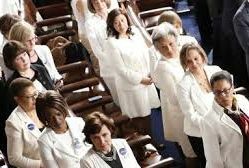 Weeks before 59 female Members of Congress had called for an investigation into allegations of sexual misconduct by the President, and during the speech Democrats were clad in solidarity black in support for the #MeToo and Time'sUp movements. Some Members wore African Kente cloths to protest the President's recent derogatory reference to the continent's "s...hole" countries. Dozens more, each allowed to bring one guest, filled seats with "Dreamers" -- undocumented immigrants who are victims of Trump's anti-immigration policies. While Trump touted heavily disputed "accomplishments" on the economy and jobs, there was no mention of what was already one of the greatest security threats of our time -- Russia's hacking of the presidential campaign, and the Mueller investigation into collusion that began just four months into his administration. What a Difference a Year Makes. Next week's 2019 SOTU follows a 35-day partial government shutdown - the longest in US history. In their first head-to-head showdown since the 2018 midterm elections and Democrat's triumphant takeover of the US House of Representatives, Trump lost round one to newly elected Speaker Nancy Pelosi. 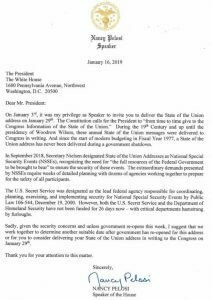 The State of the Union, originally scheduled for January 29th in the House of Representatives, was postponed by Pelosi, citing security concerns and a lack of resources amid Trump's shutdown. Although the President acquiesed to temporarily re-opening the government, his relentless demand for border wall funding and his public deadline of February 15th is expected to be a focal point of his February 5th address. In the meantime, the Mueller investigation, now in its 19th month, is coming to a conclusion. With 34 indictments or guilty pleas to-date, including many of the President's closest campaign advisors and associates, this may be the last time Mr. Trump addresses the state of the union or its citizens. 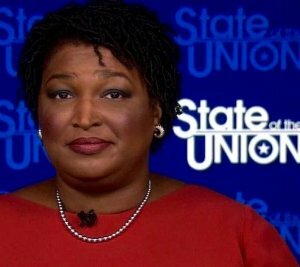 The Democratic Response will be given by 2018 gubernatorial candidate Stacey Abrams of Georgia and the Spanish-language response will be given by California Attorney General and former Congressman Xavier Becerra.